This study investigates the multiple representations of shōjō in the translated literature and print media of Japan’s Meiji era. It explores the origins of the shōjō as a yōkai, or mythical being of traditional folklore and Noh theatre, through to its unveiling as a real-life creature of the modern world, as an orangutan, initially at misemono sideshows, before its introduction to the Tokyo public at the Ueno Zoo, in 1898. The zoo, as a new framework for ordering the relationship between people and the natural world, is one of the cultural systems through which knowledge of the shōjō was constructed, circulated and experienced in this period. Examining such materials, the paper reveals contesting knowledge systems that contributed to modern experience. Translation also plays an important role in this process, and the translated literature of this era is explored and foregrounded here as an active contributor to the creation and transition of knowledge of exotic animals like the shōjō in late nineteenth- and early twentieth-century Japan. During the Meiji era [1868–1912], several species of ‘exotic’ animals became transfer points for cultural configurations, including the rakuda (駱駝; camel), zō (象; elephant), kirin (麒麟; giraffe), tora (虎; tiger) and shōjō (猩々; orangutan). The interrelated meanings of traditional symbols that were projected onto such animals during this period reveal various cultural systems through which knowledge of exotic creatures was constructed and how their representations in the public imaginary transitioned and transformed. Translation of literature also functions as a key component in this analysis, as it not only highlights cultural interference in the rendering of language but also impacts knowledge production by manipulating meaning and enacting processes of transition and transformation. Accordingly, through a cultural biography of the representation and circulation of shōjō in the translated literature and print media of the Meiji era, this study explores three key themes: the shōjō as a cultural symbol and a creature of myth, the emergence of the shōjō as a real-life animal and a symbol of modernity, and the tension created at the intersection of these two conflicting views. Shifting representations of the shōjō presented in this paper highlight the complex relationship that existed between Meiji society and the cultural understanding of animals, but may also act as a reference point and resource for further avenues of study relating to the relationship between traditional knowledge and science, culture and animals, and nature and the built environment. More broadly, such research has implications for understanding the creation and transition of knowledge, as well as overlapping knowledge systems, in late nineteenth- and early twentieth-century Japan. The history of the shōjō reveals a duality of meaning associated with the creature, from its origins as a preternatural, mythical creature of Chinese and Japanese folklore, to a real-life specimen of the natural world, as it met with advances in modern science and a rapidly changing society striving towards bunmei kaika (文明開化; civilization and enlightenment). With the establishment of Japan’s first zoo, the Ueno Imperial Zoological Gardens (東京都恩賜上野動物園) (commonly referred to as Ueno Zoo or Ueno Dōbutsuen [上野動物園]), in 1882, exhibition, spectatorship and the production of knowledge became interrelated in a public spectacle. With the introduction of this new space that merged elements of traditional culture and modern recreation, representations of animals and wildlife transmuted and transitioned into different cultural forms, contexts and meanings. Belief in bakemono and other kinds of supernatural creatures had persisted for centuries throughout Japan, but with rapidly changing political, social and economic institutions, and a growing demand for new forms of entertainment amidst an increasingly urbanising society, these creatures of traditional culture began to intersect with modern life, creating new readings and meanings of social significance—one reason for the popularity of misemono. Gyorui (魚類), for various types of rare and peculiar fish (153). In some cases, however, a single creature could appear as a motif in multiple categories. In relation to the shōjō, for instance, Furukawa cites examples such as: a koi (鯉; carp) fish exhibited as a shōjō koi (猩々鯉) due to its red colour, which was extremely rare at the time (171); the shōjō mai (猩々舞), a dance originally performed as a Shinto ritual in which a performer dressed in a Noh-style shōjō costume danced around the rim of a large pot (110); and an albino boy with reddish-brown hair, born of immaculate conception after a woman’s mysterious encounter with a shōjō of the sea, put on display by his mother for all to see as a way of “expiating her sins” (罪障消滅のため) (143–44). The shōjō motif is drawn upon here through multiple pathways of knowledge that stem from both its original representation as a monkey-like, mythical creature of Chinese origin, and aspects of the story as it was adapted into Japanese folklore and Noh tradition. 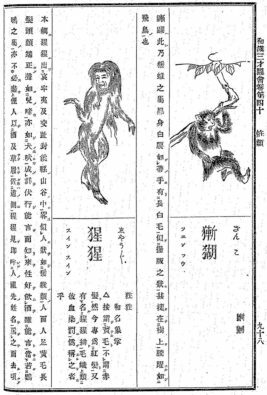 This highlights how elements of the shōjō crossed over into different categories and systems of interpretation, including shōjō as ‘imported animal’ (orangutan), shōjō as rare ‘fish’ (shōjō koi), shōjō as religious dance or performance (shōjō mai), and shōjō as ‘deformity’ (albino with red hair). Of the seven categories identified by Furukawa, however, the foreign or imported creatures were the most sought after (164). Particularly popular amongst these animals were the tiger, cheetah, elephant, orangutan and camel, and their imagery and reproduction can be found in various forms of art and literature from the period. Kawazoe (2000) indicates not only the “rarity” (珍しさ) but also the “value” (ありがたさ) and potential “benefit” (ご利益) attributed to imported animals, all of which impacted the public imaginary of both the foreign creatures and the countries from which they came (91–126). 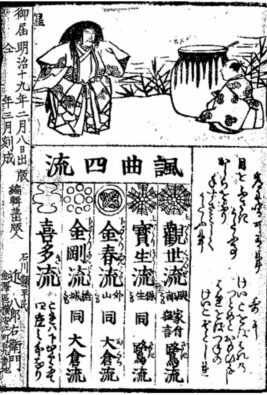 ‘Benefit’ here refers to the properties of these various animals that were considered akubyōharai (悪病払い), i.e., something able to ward off illness. Cassowary feathers, for example, were said to prevent the contraction of smallpox (疱瘡麻疹疫疹のまじなひになる), hence many spectators would visit misemono stands that exhibited cassowaries in the hope of retrieving a feather to help ward off such illness (Kawazoe 2000, 94–95). Camels were similarly believed to ward off disease and even help one achieve fūfuwagō (夫婦和合; conjugal harmony), such that medicines made from camel urine were referred to as reiyaku (霊薬) or ‘miracle drugs’. The popularity of misemono exhibits peaked around the mid-nineteenth century. However, through a series of ordinances introduced by the new Meiji government between 1870 and 1873 opposing various carnivalesque practices, the misemono began a steady decline (Figal 1999, 25–26). It seems hardly surprising, therefore, that when Tokyo’s first zoo was established at Ueno in 1882 as part of the National Museum of Natural History,5 barely a decade after the introduction of laws targeting misemono, “[t]he Japanese came to perceive zoos as amusement parks rather than as facilities for promoting education and the scientific study of animals, as well as for breeding animals for the preservation of species” (Itoh 2010, 18). The inception of Ueno Zoo in 1882 and its reception by the public, as reflected in the translated literature and print media of this era, provides insights into how the zoo both mirrored and embodied changes within Japanese culture, identity and politics throughout the later Meiji period. With the progression of modernity, the public’s view of foreign animals as creatures of awe and as quasi-spiritual beings shifted towards seeing them as objects of human rule and symbols of power. Perhaps the clearest example of this was the capture of animals by Japanese soldiers during the Sino-Japanese (1894–1895) and Russo-Japanese (1904–1905) Wars, labelled senrihin dōbutsu (戦利品動物; animal war trophies), which served as symbolic representations of the conquest of foreign lands. The exhibition of these animals at Ueno Zoo, as well as those that were gifted by other nations, thus functioned as a showcase of imperial power. A variety of animals, including dogs, horses, donkeys and camels were mobilised in military service as gun’yō dōbutsu (軍用動物; military animals) during these wars and the public could read about the animals and their performance of imperial duty in newspaper media, or otherwise witness it for themselves at Ueno Zoo’s senkō dōbutsu (戦功動物; distinguished war animal) enclosures. Beginning in 1937, Ueno Zoo even held special events, such as the senkō dōbutsu kansha no kai (戦功動物感謝の会; lit., ‘gathering for the commemoration of distinguished war animals’) and gun’yō dōbutsu ireisai (軍用動物慰霊祭; lit., ‘military animal memorial service’), as a show of appreciation to such animals for their distinguished war service.6 Thus, like the living ‘trophies’ exhibited at Ueno Zoo that served as spectacle while also demonstrating to the public the products of empire, the zoo itself performed a binary role: as a symbol of the government’s ability to compete with Western civilization and as a tool to educate the public on modern taxonomic systems, on the one hand; and, on the other, as a stage for the new Japanese empire to flaunt its power through the capture and exhibition (i.e., control) of creatures from foreign lands. Miller (2013) similarly highlights the creation of Ueno Zoo and its links to Japanese imperialism, but also cites the function of the zoo as a site for producing civilization that purposely contrasted with earlier misemono, as an institution that emulated Western scientific thought. He argues that Ueno Zoo’s “wild” animals, from a natural world somewhere “out there” (i.e., beyond civilised, modern Japan), organised into carefully planned exhibits for privileged observation, instituted the paradox of Japan’s “ecological modernity”—a term denoting the two-fold process of social transformation and intellectual separation of people from the natural world (2–3). The opening of Ueno Zoo certainly evinced the first significant change in context for the collection, display and representation of exotic animals distinct from practices of the misemono in early Meiji and previous eras. However, this disjuncture, particularly in the years immediately following its inception through to the end of the Meiji period, by no means represents a clear-cut departure from earlier exhibition practices. In many ways, this ‘new’ institution inherited the cultural attitudes of misemono proprietors, patrons and spectators regarding the treatment and interpretation of exotic animals, before they could transition into new forms of knowing and doing. The word ‘exotic’ was commonly translated in dictionaries throughout the Meiji era as ikoku (異国; foreign) or hakurai (舶来; imported) and was used to describe animals, people and products of other lands. 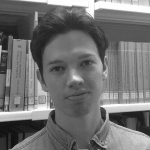 It was not until the late Meiji, then Taishō [1912–1926] and early Shōwa [1926–1989] periods— concurrent with the changing implications of ‘exoticism’ in the West—that the term came to be translated as ikoku jōchō (異国情調),7 literally meaning ‘foreign air’ and thus referring to a state of mind. As such, foreign animals or ‘hakurai dōbutsu’ imported into Meiji Japan were admired as exotic items in the general sense, as creatures of distant lands. Interestingly, however, the ‘shōjō’ was not exactly a new creature to Japan, having in fact been known there for hundreds of years as a creature of myth. Thus, when an actual shōjō was first introduced at Ueno Zoo in 1898, one can imagine people’s fascination to learn not only that the shōjō was real and on display in Tokyo, but that it was a very different creature to that of the well-known traditional tales. Apart from the difference in colour, the shōjō that flourished in the Japanese imaginary throughout the Edo and early Meiji periods is akin to that described in Terajima’s translation; that is, a monkey-like creature that likes to drink sake and has the ability to speak. 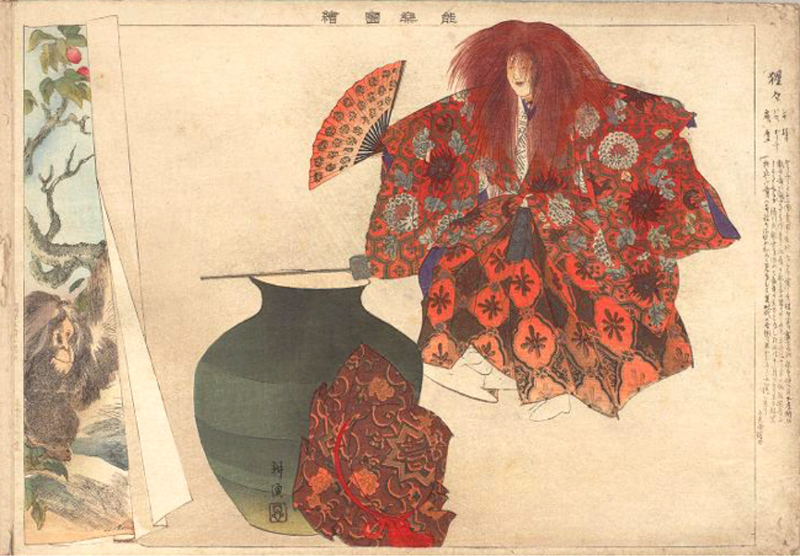 And while some interpretations perpetuate the theme of capturing a shōjō (although not for specific purposes such as food or textiles), the animal that was introduced and adapted into the cultural sphere of Japanese Noh and folklore was not a yellow-haired creature of the mountains, but a red-haired water dweller that brought good fortune. The Noh version tells of a man in China named Kōfū (高風) who lived in the village of Yōzu (揚子), at the foot of Mount Kanekin (金山). One night Kōfū has a dream that tells him he will become rich if he sells sake at the market in Yōzu. Following the dream, he begins to sell sake and becomes a wealthy man. One day Kōfū notices that the face of one of his customers never turns red, no matter how much he drinks. When Kōfū asks his name, the man replies that he is a shōjō who lives in the ocean. He tells Kōfū that if he brings some sake to the bank of the Yangtze River (潯陽の江のほとり), he will emerge from the waters to greet him. Later that day Kōfū goes down to the riverbank carrying sake and waits for the shōjō to appear. As the stars and moon begin to illuminate the night sky the shōjō appears before Kōfū; delighted to see him, the shōjō drinks the sake and dances merrily. Once he is finished, as a token of his appreciation, he presents Kōfū with a magic sake jar that never runs dry. Kōfū then wakes to find he has been dreaming, but sees that the magic jar remains.10 While the author of the original tale is unknown, the story is believed to have been in circulation from the Muromachi [c.1336–1573] through to the Edo period [1603–1868], with many variations, often relocating the setting to various regional sites around Japan (Nishino 1998, 412–14). 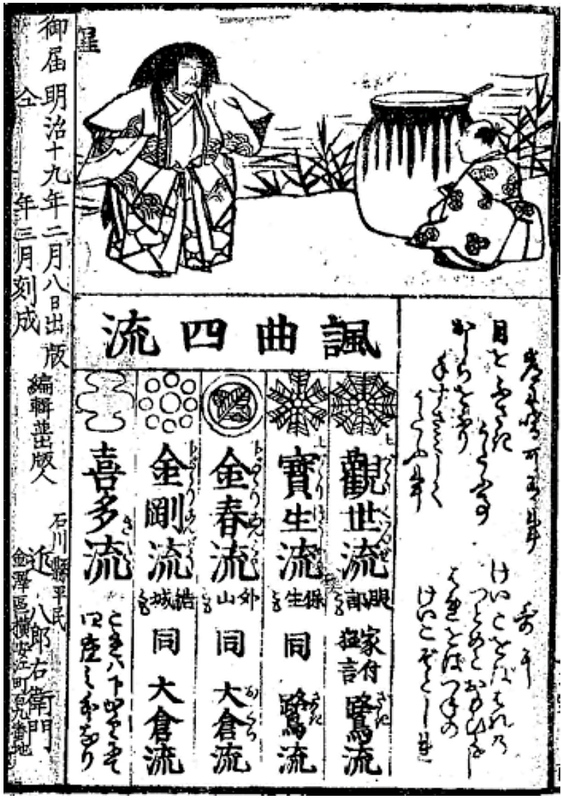 Many examples can be found of performances of the tale in the Meiji era (see Figure 2), as well as its continued circulation in printed media, some examples of which are discussed below. The shōjō of traditional tales may have resembled something of an ape, but it also adhered to the other aspects of its preternatural heritage; namely, that it could speak and drank copious amounts of sake. This created confusion among people who saw ‘shōjō’ (orangutan) exhibited as misemono in the Meiji era, as they wondered why it did not look or act like the shōjō as commonly described (i.e., the fictional ‘yōkai shōjō’). A report on the orangutan in the same newspaper the following day provided even more specific dimensions for the creature, including its weight and a description of its natural habitat, “above the trees, deep in the mountains of places like Sumatra and Borneo” (おもにスマタラ、ボルネオ等の深山中好んで樹木の頂上など) (Yomiuri Shimbun 1898a). 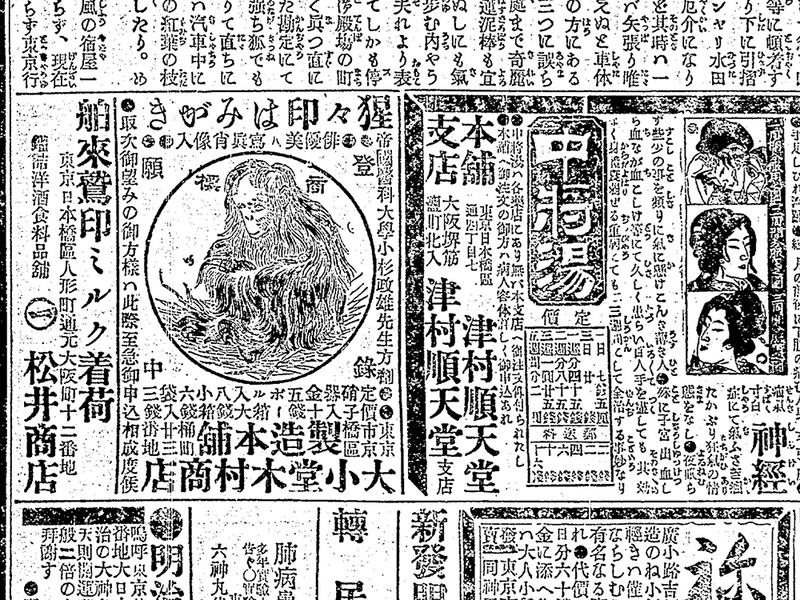 Two months later, on 15 September 1898, the Yomiuri Shimbun (1898b) featured another article titled “Shōjō no ōatari” (猩々の大當り; “Shōjō a Big Hit”), which details the popularity of the latest addition to the zoo, with more than 20,000 visitors attending in one day, leading to the sale of various shōjō goods—even shōjō jirushi hamigaki (猩々印はみがき; lit., ‘orangutan-brand toothpaste’) (see Figure 3). However, what the expression ‘ōatari’ in the above headline suggests is an attitude towards the exhibition, spectatorship and commercialisation of animals that harks back to misemono practices (Yomiuri Shimbun 1881). Figure 3: ‘Orangutan-brand toothpaste’ in Asahi Shimbun (1898b). Edgar Allan Poe’s short story, “The Murders in the Rue Morgue” , is a murder-mystery, often credited as the first modern detective story, about a man named C. Auguste Dupin who attempts to solve the mystery of the brutal murder of two women in Paris by an unknown and seemingly superhuman assailant. The story was first translated in Japan by Kōson Aeba [饗庭 篁村; 1855–1922] as “Rū morugu no hitogoroshi” [ルーモルグの人殺し], serialised in the Yomiuri Shimbun newspaper from 14 to 30 December 1887. The second translation14 was Shūtō Osada’s [長田 秋濤; 1871–1915] “Shōjōkai” (猩々怪; lit., ‘Supernatural Shōjō’), published in the literary magazine Bungei kurabu [文芸倶楽部; Literary Club] in October 1899.15 Despite the focus of the original story on the element of mystery and the detective-style logic of Dupin as he pieces together clues to solve the crime, Osada chose to frame the story as a supernatural tale in the tradition of Japanese kaidan (怪談). Not only did he translate the title as ‘Shōjōkai’—kai (怪) signifying the presence of strange or supernatural elements—he also explicitly stated in his preface: “This tale [kaidan] was told to me during my time in Paris” (此怪談は予が嘗て巴里に居つた時分、人から聞いた話で) (Osada 1899, 118). While the story certainly displays elements of the uncanny, Osada’s decision to reposition the story as a kaidan tale would seem unconventional were it not for the implied presence of a shōjō and the duality of its interpretation in the Meiji context. “The Murders in the Rue Morgue” ends with the revelation that a sailor had recently captured an orangutan in Borneo and brought it back to Paris intending to sell it. Before he can do so, however, the orangutan escapes its enclosure and in a frightened state, on the loose in the streets of Paris, it accidently kills two women in the Rue Morgue. Ueno Zoo had of course acquired an orangutan one year prior to the publication of Osada’s “Shōjōkai”. While the traditional shōjō certainly figures in the popular imaginary as a preternatural creature, the modern shōjō was very real, and for the Tokyo public in 1898–1899, the idea that a shōjō living in their midst could escape and wreak havoc on the city streets was perhaps frighteningly feasible. Thus, Osada’s translation hinges on an overlap of meaning, bringing the supernatural shōjō into dialogue with modern Japan and the presence of an actual shōjō in Ueno Zoo. The circumstantial overlap of an escaped orangutan in Paris and Ueno Zoo’s recent acquisition of its own orangutan becomes the contextual grounds for the introduction of a ‘modern-day’ creature into the kaidan genre, and this for the potential threat it posed to the capital of modern Meiji society. As stated previously, until the increased introduction and assimilation of Western knowledge in the Meiji era, shōjō were generally regarded as quasi-mythical, water-dwelling, sake-loving creatures, known from folktales and Noh theatre. What Osada’s translation reflects, though, is a perception that perfectly encapsulates the transitory nature of knowledge surrounding the shōjō at this point in Japan’s history. While the nature of the orangutan in the 1841 original is “sufficiently well known to all” (i.e., in Paris), the mere existence of a shōjō in Japan in 1899 is presented as cause for astonishment, highlighting the conflicting views of the shōjō as a fictional mythical creature and a real-life creature of modernity. Indeed, a number of publications can be found in the early Meiji period that explicate the term ‘shōjō’ as ‘orangutan’, including Dōbutsu kunmō: Shohen (honyūrui) (動物訓蒙 初編 [哺乳類]; lit., ‘Guide to Animals: Volume 1 [Mammals]’) in 1875, applying the same Chinese characters for the original preternatural shōjō (i.e., 猩々) to the real mammalian shōjō (i.e., orangutan), shown in Figure 4 (Tanaka 1875). Interestingly, Kōson Aeba’s initial 1887 translation of “The Murders in the Rue Morgue” refers to the murderer as “a giant monkey called an orangutan” (オラングウタンといふ大猿), suggesting the true identity of the animal was still relatively unknown to the wider public at that time. Figure 4: Shōjō (captioned “Orang Outang”) in Dōbutsu kunmō . Following the introduction of a real shōjō into Ueno Zoo in 1898, a sudden rise in the number of publications relating to traditional tales of the shōjō surfaced—no doubt an attempt to capitalise on the recent fad for all things orangutan. 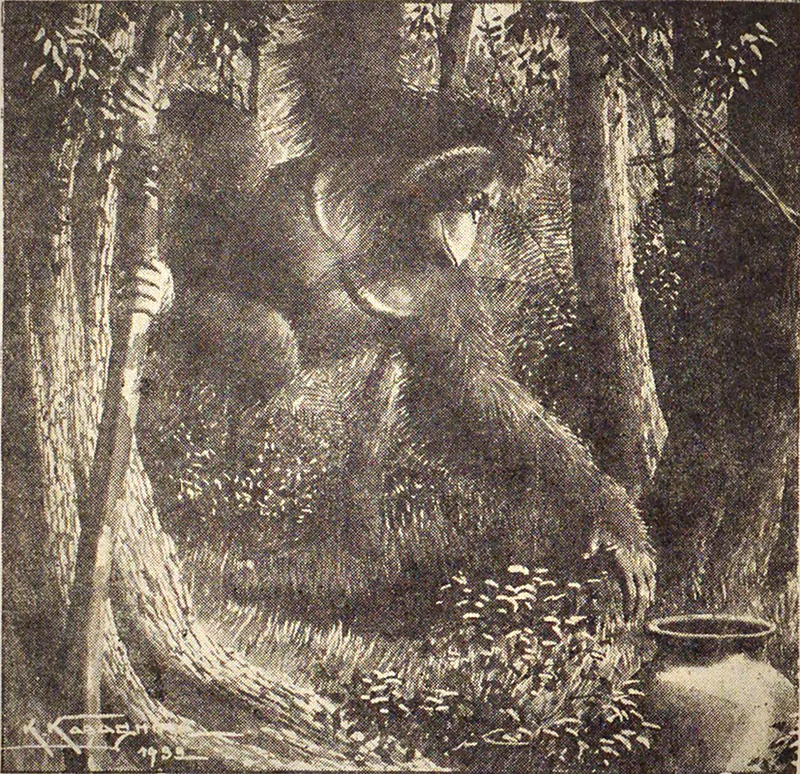 In the same year that Osada’s “Rue Morgue” translation was published, other stories and images appeared of the shōjō as both traditional, mythical creature and in its ‘true form’ as an orangutan, including Kyōiku mukashibanashi: Shōjō no hanashi (教育昔話 猩々の話; ‘Educational Old Tales: Story of the Shōjō’), shown in Figure 5 (Honekawa 1899, 15), and a compilation of artworks entitled Nōgaku zue (能楽図絵; Noh Studies Illustrated) depicting scenes from well-known Noh plays, including Shōjō (猩々) (Kawanabe 1899, 3–4). Particularly interesting for this study is an illustration in Nōgaku zue, depicting a Noh performer playing the role of a shōjō as a sake-drinking yōkai, while an actual shōjō (orangutan) appears from the side of the page as though revealing its true form to the reader (see Figure 6). 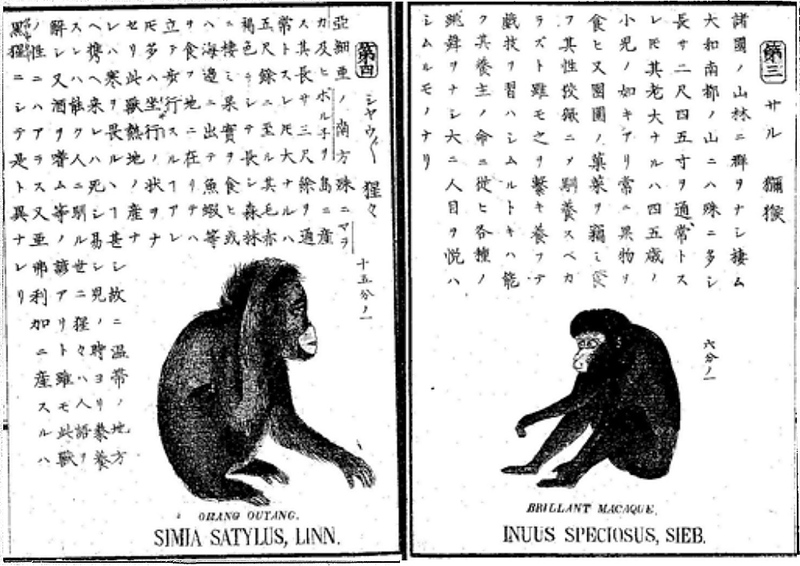 As with Osada’s translation “Shōjōkai”, this picture seems to represent how the Meiji individual may have processed knowledge about exotic animals like the orangutan. The dual presence of the mythical shōjō (adapted to the Noh tale) and the shōjō of the modern world (orangutan) reflects the multiple meanings, sites and audiences through which an understanding of the creature in the public imaginary developed, exemplifying the transitory state of knowledge of the shōjō during this period. 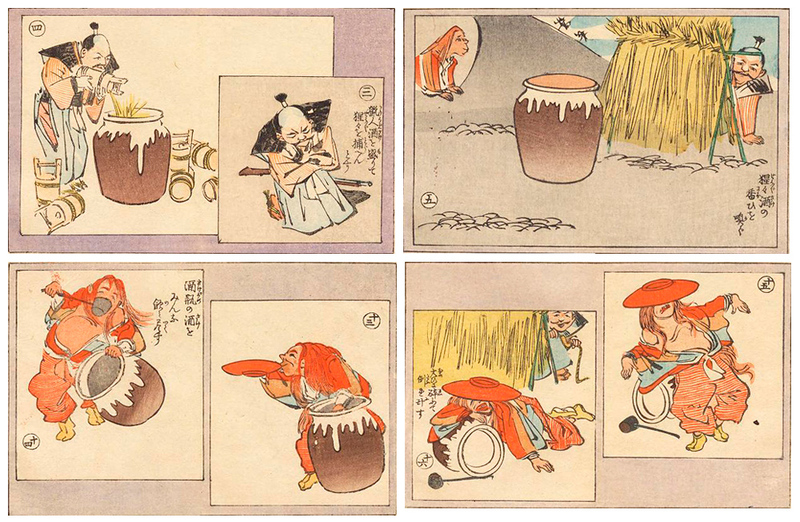 Figure 5: In this variation of the story, a man attempts to catch the shōjō by luring it out with a pot of sake and waiting for it to pass out drunk. From “Shōjō no hanashi” (猩々の話; ‘The Story of the Shōjō’) in Kyōiku mukashibanashi [教育昔話; ‘Educational Old Tales’], 1899. Figure 6: A creature of myth and modernity: Shōjō in Nōgaku zue (Tsukioka 1898, 54). Despite this acknowledgement, preliminary research suggests further investigation of the shōjō in later periods might continue to show an overlap of myth and modernity in the circulation of shōjō knowledge. An illustration in Yōichirō’s Minami [南 洋一郎] Hoeru mitsurin: Mōjū seifuku (吼える密林 猛獣征服; ‘Roar of the Jungle: Conquest of Beasts’) published in 1938—26 years after the end of the Meiji era—depicts an alcohol-loving shōjō that is lured out of hiding with a giant pot of sake and captured, illustrating how traditional knowledge remained influential in preceptions of the creature well into later periods of ostensibly modern history (see Figure 7). What the popularity of the shōjō in Meiji Japan reveals is a much broader and persistent fascination with animal figures in the pursuit of scientific knowledge that continued well into the Shōwa era. Engagement with the animal kingdom, not only through public spaces such as Ueno Zoo, but also through the literature and printed media of the era, enabled the Meiji citizen to enrich their understanding of their expanding world and Japan’s place in it. 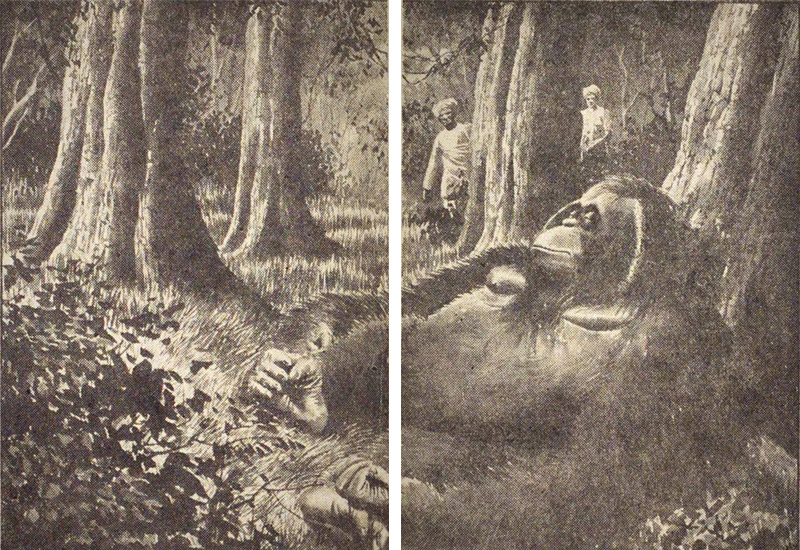 Figure 7: Hunters in Yōichirō Minami’s  Hoeru mitsurin: Mōjū seifuku (吼える密林猛獣征服; ‘Roar of the Jungle: Conquest of Beasts’) attempt to catch a shōjō (orangutan) by luring it with sake and waiting until it passes out (111, 116–17). Knowledge of the shōjō here continues to overlap with traditional tales, such as that described in Figure 5. The sociocultural geography of the shōjō and the animal’s interpretation across a range of sites and contexts of meaning in this period intersects with what Secord (2004) terms “knowledge in transit” (654–72). Through various categories of movement, dissemination and translation, the distinction between making knowledge and communicating knowledge becomes blurred, even illusory. For Secord, tracing acts of communication, including texts, images and objects, and giving attention to practices of knowledge circulation on a broad scale, can act as bridging studies between specific works and their wider contexts (666). Locating exotic creatures like the shōjō and their role in the Meiji literary imagination reveals the specific social, cultural and scientific contexts within which the connection between traditional culture, animals and modern science was constructed in this period and how representations of the shōjō transitioned through various knowledge systems, promulgated through translation. While Osada’s supernatural reimagining of Poe’s text, whether intentionally or instinctually, deviates from the source material, it reveals an awareness of the historical cache of mystery surrounding the shōjō. Foregrounding the uncanny aspects of the story, therefore, perhaps heightened the tension of Poe’s tale, effecting a reading that was more relevant and comprehensible to the Meiji reader. Ultimately, what the study of translation and translated literature provides is insight into another facet of knowledge production and transition, the act of translation demonstrating that ‘transition’ here involves a process of manipulation as well as movement—of language, culture, and ideas. This paper has outlined the significance of exotic animals in Meiji Japan with a focus on the intersecting representations of the shōjō (orangutan). Through an investigation of the printed media and translated literature that circulated concurrent to the import of the orangutan into Ueno Zoo, multiple interpretations of the shōjō can be identified from this era. Analysis of animal collection and exhibition practices of early- and pre-modern Japan, as well as the literary writings and topical articles that circulated through newspaper media of the Meiji era, highlights the various avenues through which the public constructed meanings from the ‘exotica’ that were imported animals. The thriving misemono business of the pre-Meiji period in particular, suggests that these attractions developed as sites of mystery, awe and sensory engagement, as many establishments provided not only the chance to witness these rare spectacles but also interact with them in multiple ways. However, in later periods, interaction with animals also became an act of consumption, as demonstrated by the commodification of animals as ‘war trophies’ (‘senrihin’, in which hin literally denotes an ‘item’ or a ‘product’) and as brands in product advertising (e.g., orangutan-brand toothpaste). To better understand the impact of the changes that influenced the ways knowledge about animals was processed in Meiji Japan, it is therefore necessary to examine the cultural practices of preceding eras. The mid-nineteenth century, and specifically the bakumatsu (幕末; lit., ‘end of the bakufu’, referring to the end of the Tokugawa shogunal government, between 1853 and 1868), represents the transition from the Edo period to the new Meiji era, and with it, the creation of new sites and contexts for interactions with the natural world. Animals bear various cultural meanings and sociological implications in different societies, and such ideas evolve over time. Following the Meiji Restoration in 1868, animals were a crucial medium for the dissemination of Western thought and modern science imported through translation. A number of translations from this era not only draw upon animals to highlight the progression of scientific thought and the shifting relationship between man and nature, but also reveal the fervor for natural history and the classifying or categorising of new species, both plant and animal—exemplified by the newspaper article cited above, which subjected the orangutan to meticulous measurement of its bodily dimensions. The pervasiveness of representations of exotic landscapes populated by foreign creatures in the printed media and translated literature of the Meiji period further reveals how a culture of natural science and animal collection in this era became bound to national identity. The role of exotic animals in Meiji Japan was therefore multifaceted, as they served as symbols of the modern world, not only for their value as items of trade between foreign nations but also for the associations that came to be drawn between the collection and exhibition of foreign animals and Japan’s concurrent imperial expansion. This is a process that accelerated and developed in parallel to Japan’s expanding commercial and eventually military presence in Asia. 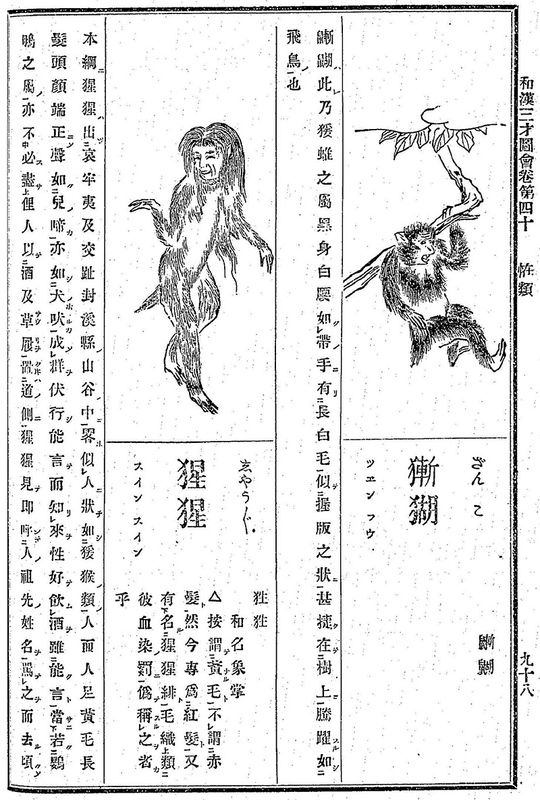 Traditional cultural understandings of the shōjō certainly influenced the way the ‘modern day’ orangutan was interpreted by the general populace in Meiji Japan—the confusion surrounding the appearance of a monkey (orangutan) advertised as a ‘shōjō’ at sideshows in the early Meiji era illustrating the confrontation between traditional and scientific knowledge systems of this period. As demonstrated by Shūtō Osada’s reimagining of Poe’s “The Murders in the Rue Morgue” as a Japanese kaidan, however, cultural knowledge also facilitated a greater understanding of new foreign literature for people of a developing Meiji society more familiar with popular shōjō imagery and its connection to the other-worldly. Osada’s “Shōjōkai” reveals that knowledge is a process of dynamic, fluid and constantly changing ideas, impacted by greater society and changing institutional, cultural, economic, and political climates. The transition of knowledge, therefore, as demonstrated by multiple representations of the shōjō in the Meiji era, is not a linear process that sees the cultural transmission of images, ideas and beliefs shift swiftly towards a more scientific understanding; rather, it demonstrates a process of constant movement, inextricably linked to both culture and society, and highly susceptible to the influence of both human and non-human intermediaries. The producers and receivers of knowledge about the shōjō during the Meiji period included misemono proprietors, spectators, zoologists, the Meiji government, translators, journalists and general readers. Moreover, while the manifold representations of the shōjō visible in various forms of print media and translated literature of this era reflect the processes of a knowledge system in transit, they also reflect the very nature of translation itself. Aeba, K. [饗庭　篁村]. 1887. “Rū morugu no hitogoroshi” [ルーモルグの人殺し], Yomiuri Shimbun (supplement) [読売新聞〈附録〉], 14–30 December. Asahi Shimbun (Morning Edition) [朝日新聞〈朝刊〉]. 1898a. “Shōjō” [猩々], 11 July. ————. 1898b. “Shōjō jirushi hamigaki” [猩々印はみがき], 13 December. Asakura, M. [朝倉　無声]. 2002. Misemono kenkyū [見世物研究]. Chikuma Gakujutsu Bunko [ちくま学術文庫]. Figal, G. A. 1999. Civilization and Monsters: Spirits of Modernity in Meiji Japan. Durham and London: Duke University Press. Furukawa, M. [古河　三樹]. 1970. Misemono no rekishi [見世物の歴史]. Tokyo: Yūzankaku [雄山閣]. Honekawa, D. [骨川　道人]. 1899. Kyōiku mukashibanashi Shōjō no hanashi [教育昔話 猩々の話]. Tokyo: Matsuki Heikichi [松木平吉]. Itoh, M. 2010. Japanese Wartime Zoo Policy: The Silent Victims of World War II. New York: Palgrave Macmillan. Kawanabe, Y. [河鍋　豊]. 1899. Nōgaku zue [能楽図絵]. Tokyo: Ejima Ihē [江島伊兵衛]. Kawato, M. [川戸　道昭] and T. Sakakibara [榊原　貴教], eds. 1997. Meiji hon’yaku bungaku zenshū (shimbun zasshi-hen) 19 Pō shū [明治翻訳文学全集 <新聞雑誌編> 19 ポー集]. Tokyo: Ōzora [大空]. Kawazoe, Y. [川添　裕]. 2000. Edo no misemono [江戸の見世物]. Tokyo: Iwanami Shoten [岩波書店]. Kuroda, H. [黒田　日出男]. 1994. “Misemono to kaichō—Misemonoshi toshite no kinsei” [見世物と開帳—〈見世物〉史としての近世]. In Gyōretsu to misemono Asahi hyakka Nihon no rekishi bessatsu Rekishi o yominasu 17 [行列と見世物朝日百科　日本の歴史別冊 歴史を読みなおす17], edited by H. Kuroda and R. Toby, 58–69. Tokyo: Asahi Shimbunsha [朝日新聞社]. Miller, I. J. 2013. The Nature of the Beasts: Empire and Exhibition at the Tokyo Imperial Zoo. Berkeley: University of California Press. Minami, Y. [南 洋一郎]. 1938. Hoeru mitsurin Mōjū seifuku [吼える密林 猛獣征服], illustrated by K. Kabashima [樺島 勝一]. Tokyo: Dainihon Yūbenkai Kōdansha [大日本雄弁会講談社]. Nakamura, T. [中村　徳助]. 1910. “Shōjō”. In Sekai shinotogi [世界新お伽], 211–19. Tokyo: Seirindō [盛林堂]. Nishino, H. [西野　春雄]. 1998. “Shōjō” [猩々]. In Yōkyoku hyakuban [謡曲百番], 412–14. Tokyo: Iwanami Shoten [岩波書店]. Osada, S. [長田秋濤]. 1899. “Shōjōkai” [猩々怪]. Bungei kurabu [文藝倶楽部] 5 (13): 118–36. Poe, E. A. 2009. “The Murders in the Rue Morgue.” In The Collected Tales and Poems of Edgar Allan Poe. London: Wordsworth. Secord, J. 2004. “Knowledge in Transit.” Isis 95: 654–672. Sugano, H. [菅野　宏文]. 2004. Ōmu, ōgata inko no i, shoku, jū [オウム、大型インコの医・食・住]. Tokyo: Dōbutsu Shuppan [動物出版]. Tanaka, Y. [田中　芳男], ed. 1875. “Dai 4 Shōjō” [第四　猩々]. In Dōbutsu kunmō Shohen (honyūrui) [動物訓蒙 初編<哺乳類>], illustrated by G. Nakajima [中島　仰山], 6. Tokyo: Hakubunkan [博文館]. Terajima, R. [寺島　良安]. 1888. Wakan sansai zue (chūnomaki) [和漢三才図会<中之巻>]. Osaka: Chūkindō [中近堂]. Tsukioka, K. [月岡　耕漁], illust. 1898. “Shōjō” [猩々]. In Nōgaku zue [能樂圖繪], 54. Tokyo: Matsuki Heikichi [松木平吉]. Ueno Zoological Gardens [東京都恩賜上野動物園], ed. 1982. Ueno dōbutsuen hyakunenshi (shiryō-hen) [上野動物園百年史 <資料編>], Tokyo: Daiichi Hōki Shuppan [第一法規出版]. Yamato Shimbun [やまと新聞]. 1892. “Tsutamomiji” [蔦紅葉], 29 December. Yomiuri Shimbun (Morning Edition) [読売新聞 〈朝刊〉]. 1881. “Misemono ni indo kara shiireta saru ga futsukayoi, kōgyōshi ga ōyowari/Tokyo, Kakigara-chō” [見せ物にインドから仕入れた猿が二日酔い、興行師が大弱り／東京・蠣殻町], 12 July. ————. 1898a. “Dōbutsuen ni shōjō kuru” [動物園に猩々來る], 12 July. ————. 1898b. “Shōjō no ōtari” [猩々の大當り], 15 September. Yoshino, S. [吉野 誠吉]. 1875. “Tōshoran” [投書欄], Yomiuri Shimbun [読売新聞], 7 October.